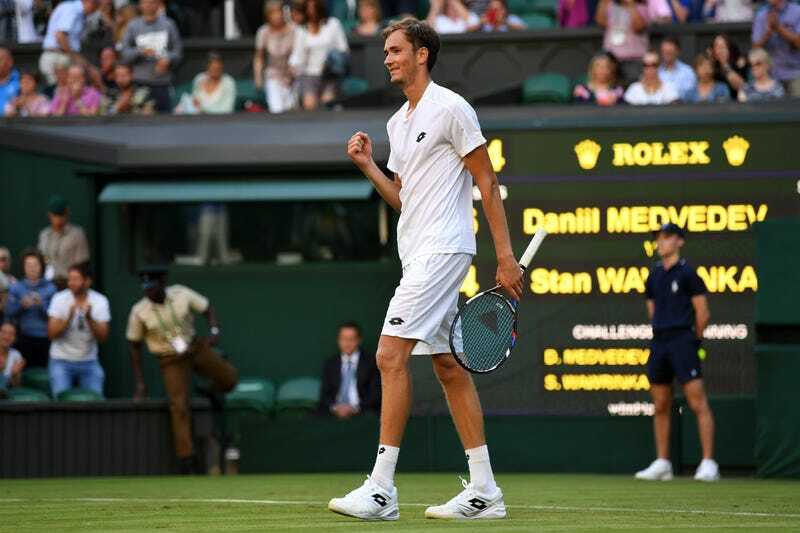 Daniil Medvedev’s first-ever Wimbledon burned hot, brief, and stupid. The 21-year-old Russian upset No. 5 seed Stan Wawrinka in the first round, and today he exited in a remarkable meltdown. After going down 5-2 in the final set of his second-round match against Ruben Bemelmans, Medvedev grew frustrated with the umpire’s calls and demanded that she be replaced. This request was unsurprisingly denied. After losing 6-4, 6-2, 3-6, 2-6, 6-3, the world No. 49 opened his wallet and began flipping coins at the umpire’s chair as if to suggest that she was biased. The Russian was losing 3-1 in the first set but, as he looked to regain his momentum, the umpire, Sandy [sic] French, called his forehand wide. At the conclusion of that game, Medvedev was disqualified from the match for unsportsmanlike conduct, because he had “questioned the impartiality of the umpire, based on her race.” He’ll now await fresh punishment from the ATP after this latest fit. Update (July 6, 6:39 p.m. ET): The original version of this post misspelled the name of umpire Sande French. It has been corrected.